Whilst some manufacturers apparently can't wait, to churn out new netbook models onto the market, others have all the time in the world. 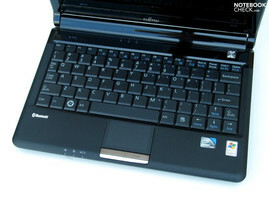 Fujitsu would be named here as an example for mini-notebooks. 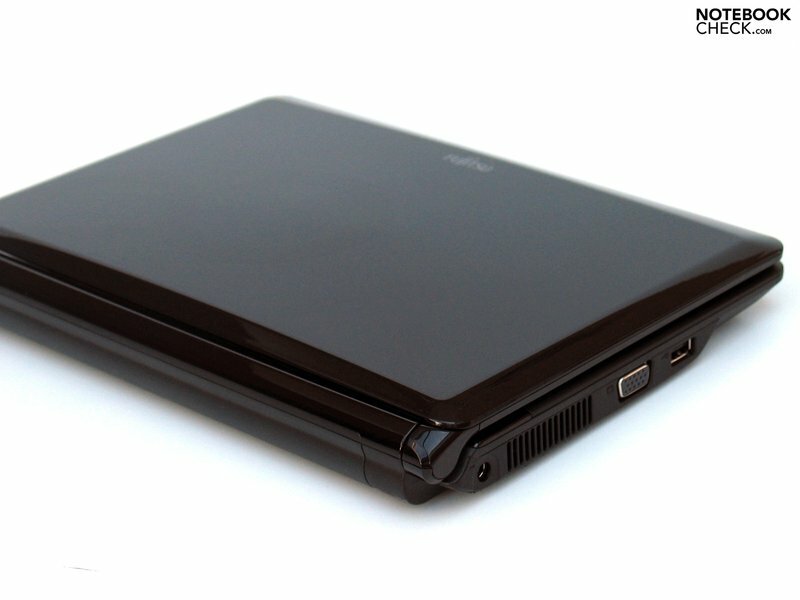 Now the Japanese manufacturer releases its first netbook in a 10 inch format labeled M2010 on the market - over a year later than the emergence of the first mini-PC. 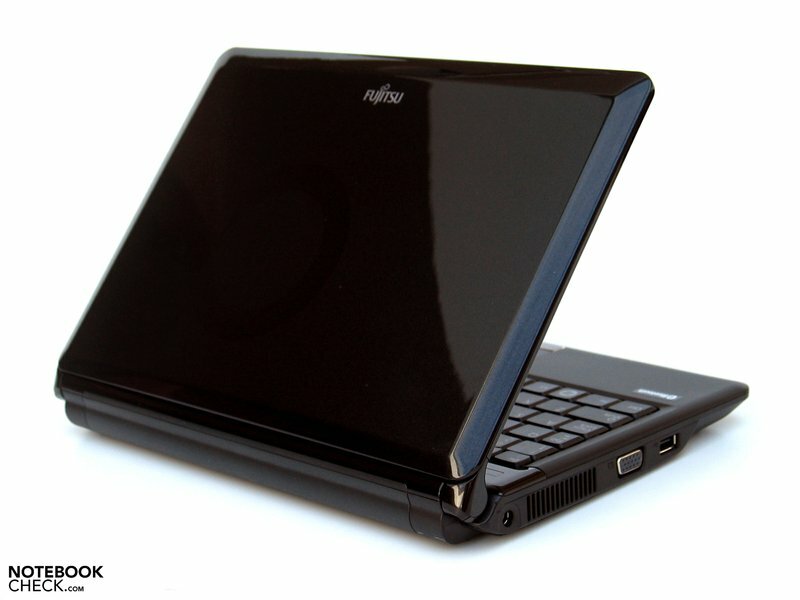 Fujitsu Amilo Mini Ui3520 is the name of the first netbook version, but with a 8.9" display size. As almost all manufacturers have turned to the somewhat input-friendlier 10 inch devices, the urge to comply must have become to strong to resist - even in Japan. 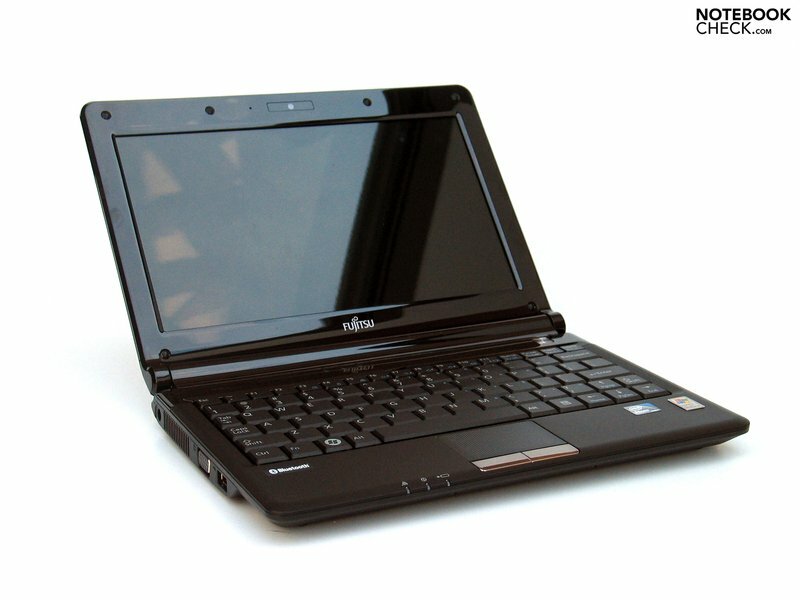 The M2010 doesn't belong to the Amilo model range, which is why the netbook presents itself in a completely contrasting design. In opposition to the futuristic traits of the current Amilo range, the M2010 looks almost plain and common. The base unit is slightly wedge-shaped and shows itself as softly rounded and compact. The display hinge on the devices's rear edge provides for a bit more individuality, though. Therewith, the base unit is lifted at its rear edge and runs downwards in a curve. 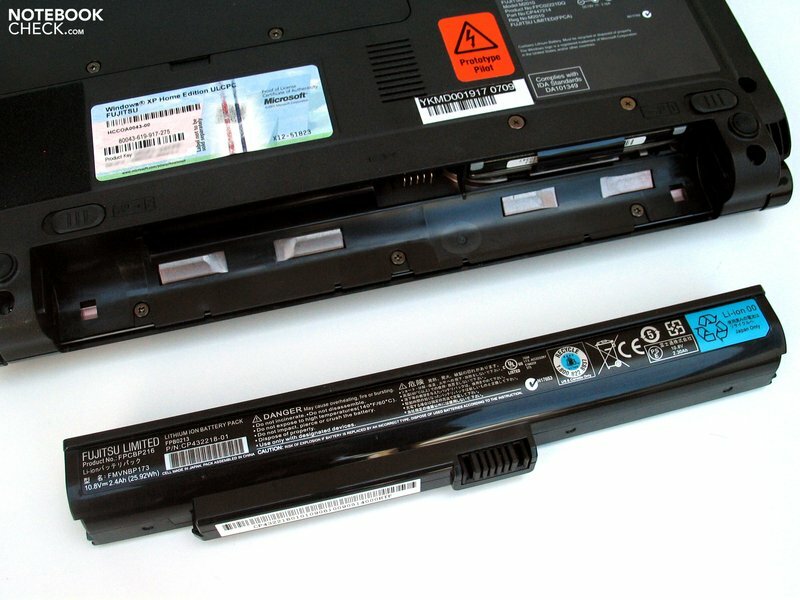 The netbook's battery also finds its place here, which makes a bit more construction height available than in the front area - a principle of design already known from other manufacturers. Our M2010 makes a very restrained impression, as well. 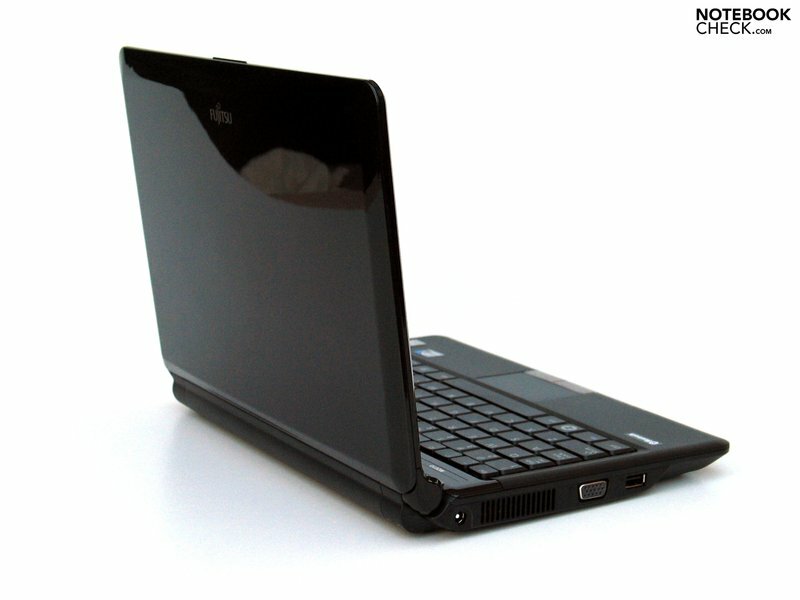 The Fujitsu mini-notebook presents itself completely in black. The orange sticker, which identifies the device as a prototype on the bottom side of our test device, was highlighted even more. Therefore, we must of course, emphasize that there might be deviations to the versions in retail. Fujitsu also indicates two other color alternatives (red metalic and pearl white), which are supposed to be currently availble. The case stability turned out to be impressive, anyway. Neither the base unit nor the display allowed exagerated deformations under pressure and also didn't show any noticeable deformations at a normal handling of the device. 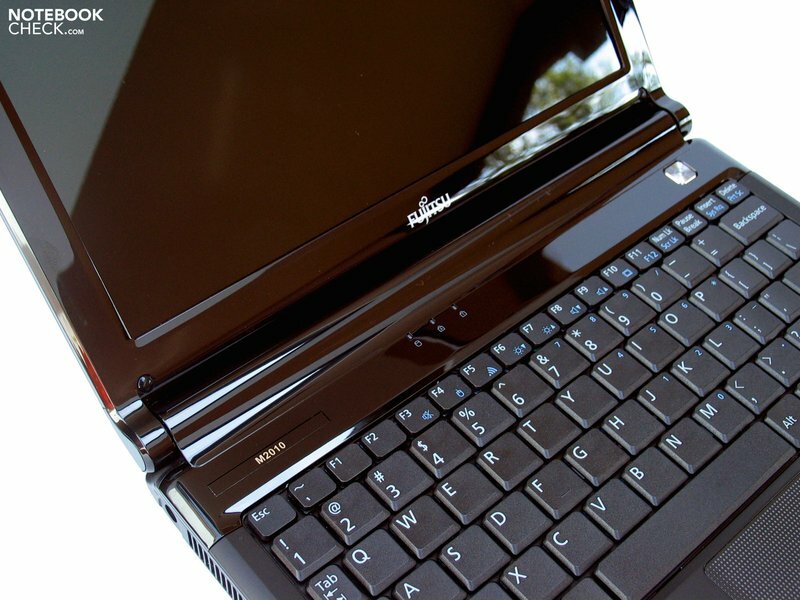 The netbook can be unhesitatingly picked up on all edges and ends - in the display area, too. This doesn't provoke any deformations of the plastic case, but the mini-notebook is then decorated with numerous fingerprints. 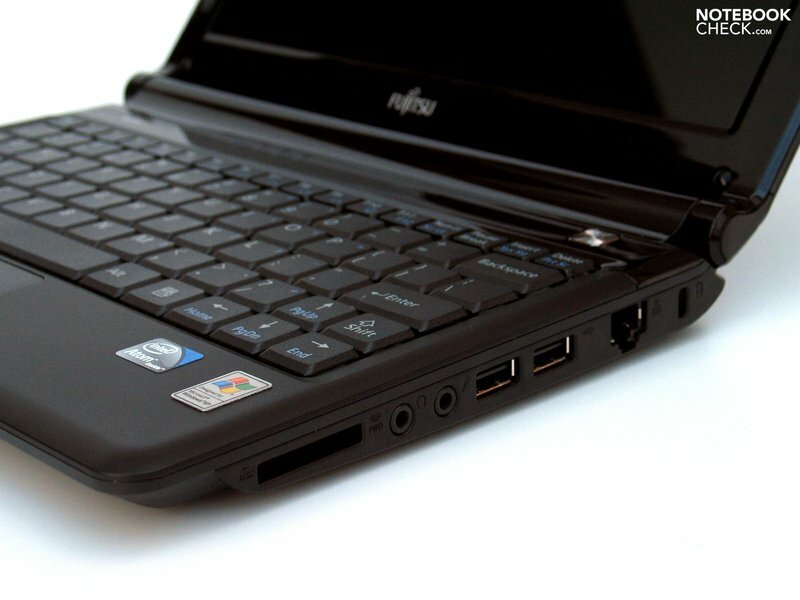 Fujitsu pleasingly uses matt finished surfaces for the palm rests, but the glossy area starts at the keyboard's upper edge. As pretty as it may be to look at in a brand new state, the high-gloss coating blemishes quickly by an uncountable number of dust particles and fingerprints . A frequent use of a cleaning cloth won't be spared. More fatal is the susceptibility for permanent scratches, which can happen fast, particularly in mobile use. Even our test sample was already showing traces of use. 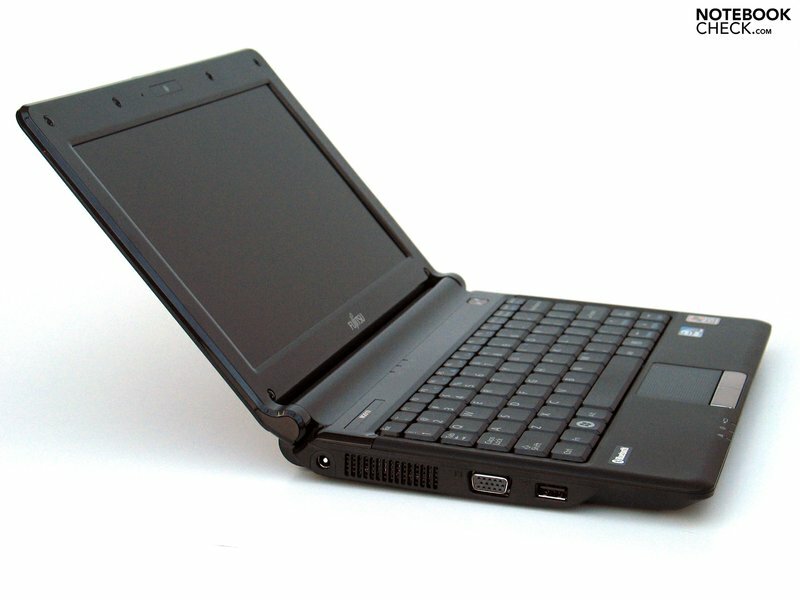 In this regard, there are practically no modifications worth mentioning, as the M2010 orientates itself on its numerous netbook colleagues. 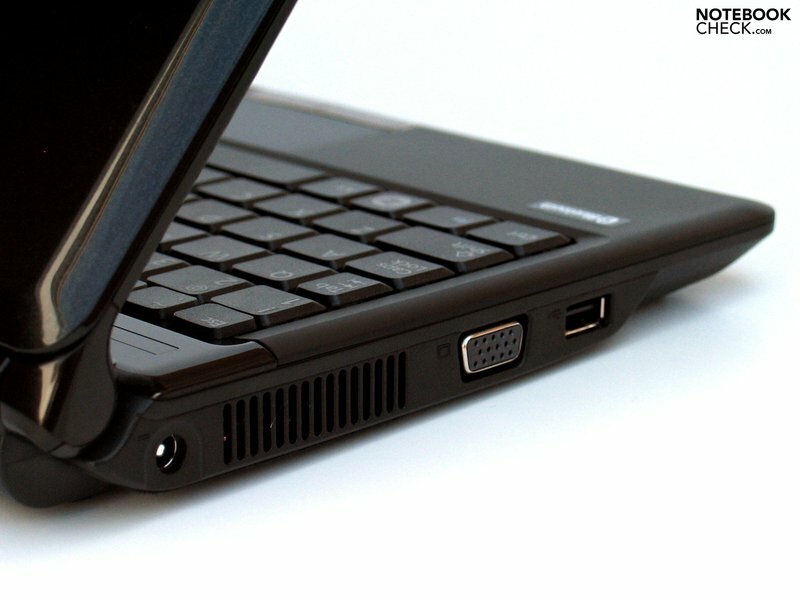 The basic ports, starting with a total of three USB ports, an analog VGA-port, a 4in1 cardreader, a 3.5 millimeter sockets for connecting a microphone and headphones as well as a LAN port are given. The interfaces are only placed on the lateral edges, whereas they are concentrated in the center area of the left and distributed along the entire right side edge. This alignment is quite alright for mobile use, but it can come to a considerable surge of cables and plugs, depending on the connected peripherals, at stationary use of the compact 10 incher. The included VGA port might be of interest in this regard, which is ultimately the only possibility to attach a larger display to the mini-notebook. 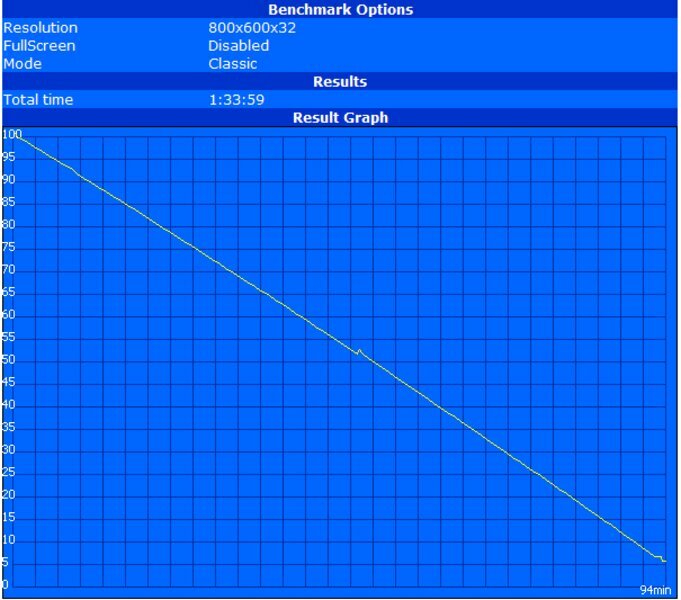 The Fujitsu M2010 supplied an acceptable and working suitable image at a resolution of 1920x1200 pixels (32 bit) in the test with a 24 inch Dell 2408 WFP monitor. Particularly, the color representation was needy of getting used to, but this shouldn't be a problem for undemanding office tasks. 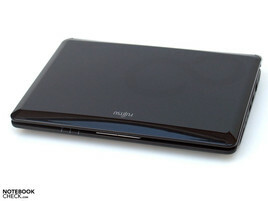 In view of communications, the Fujitsu M2010 has a combination of a cable-bound Ethernet connection (Realtek Fast Ethernet 10/100), Wireless LAN from Atheros (AR5007EG) and integrated Bluetooth. An integrated UMTS/HSDPA isn't supported yet. The installed software utility from Atheros caused problems at the attempt to connect with WLAN. Many users could have problems with the numerous compulsory settings (new profile, security settings, etc.). 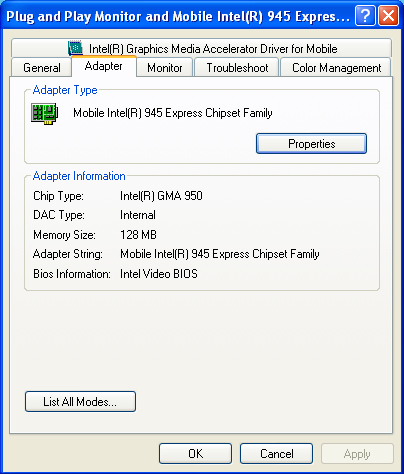 Therefore, it's advisable to switch to the Windows WLAN tools via a right click on the Atheros tool (Select Client Software). It's enough to double click on the found network, enter the password and ... you're online. The webcam might be listed as further software. This provides for video-telephony in an adequately good quality with a resolution of 1.3 megapixels. It provided a sufficiently smooth image up to a resolution of 640x480 (VGA). However, intense streaks turned up in motion at 1280x1024 pixels, making this resolution is only suitable for motionless pictures. Even if the Fujitsu M2010 doesn't use the complete case width for the keyboard, it turns out to be sufficiently dimensioned to allow an extensive text input - at least as for the stroke surface of the 14 x 13 millimeter sized standard keys. Our test sample unfortunately had an English layout, which in return meant it only had a single-rowed enter key, the mutated vowels were missing and the y and z keys were swapped. Due to this, initial typing problems and frequent typos occured. A few keys had to be content with a narrower width, but this wasn't noted as negative in the test. In return, the arrow keys have to mentioned positively, as they are executed in a normal size and could be used perfectly. The typing feel can be described as having an especially short stroke length and a distinctly palpable pressure point. Subjectively, we experienced even longer typing on the keyboard to be pleasant. 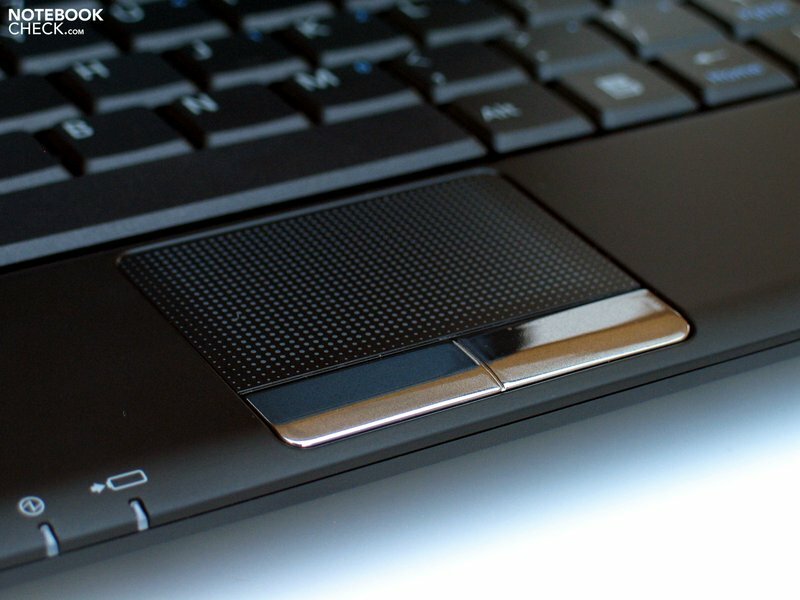 The touchpad is netbook-typically very small. However it has a very agreeable surface. We couldn't accustom ourselves to both the correlating keys, which only responded under very high pressure and emitted an extremely loud clicking noise when triggered. Not only the generated soundscape but the clicking itself gets very annoying after a few hours of use. 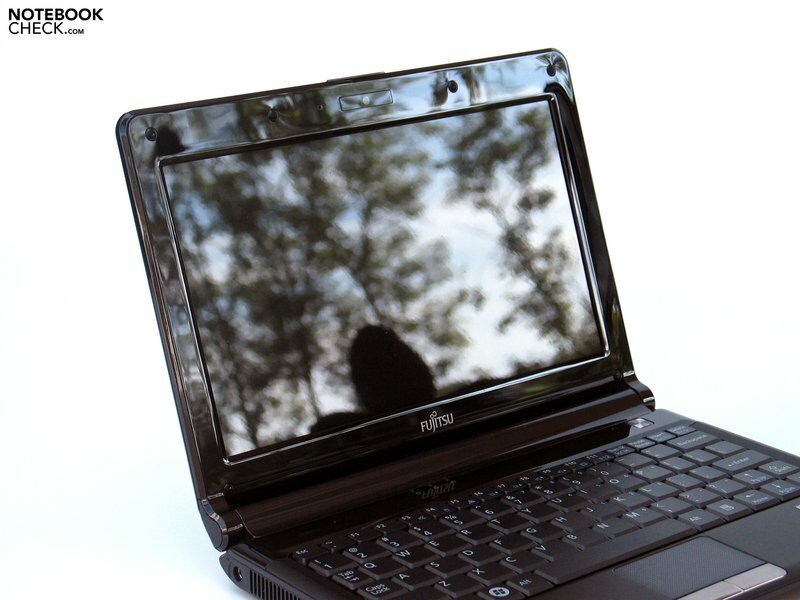 As to the display, Fujitsu uses the netbook standard, as well. 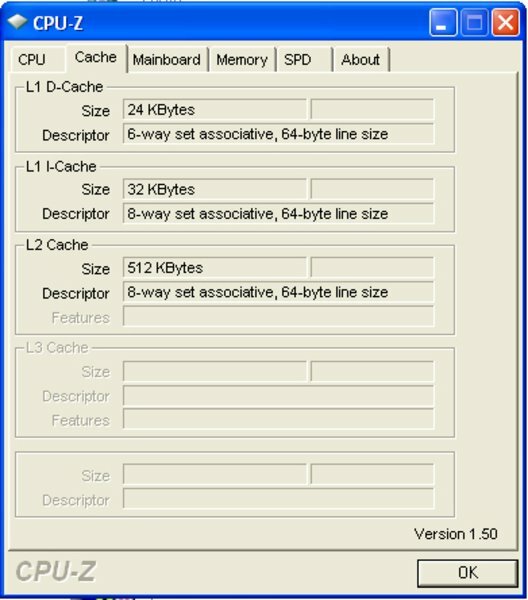 A 10.1 inch WSVGA screen with a resolution of 1024x600 pixels is employed. This trend is also consistent in the display surface coating. The display presents itself in a glossy "BrilliantView" look. The maximum brightness of up to 246 cd/m2 was established and it also stayed in a good range with an average of 225 cd/m2. It's probably due to the LED display lighting that the brightness distribution has an illumination of 85% and therefore is in an equally good field. The screen but then has to give up this good debut when it comes to the image contrast. The Fujitsu M2010 only reaches an average maximum contrast ratio of 167:1 with a black value of 1.35 cd/m2. 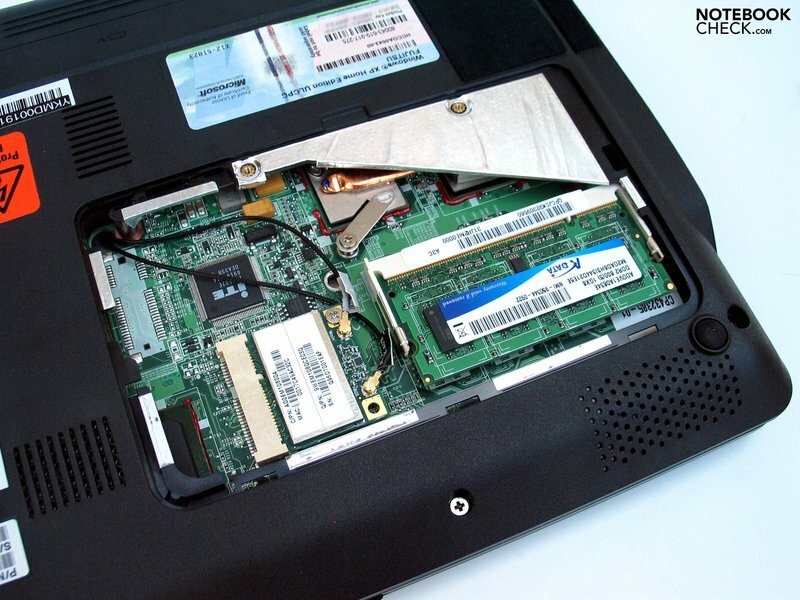 Subjectively, the image representation can be called sufficient for a netbook, anyway. Unfortunately, irritating reflections, due to the glossy display surface, have to be struggled with at outdoor use. Whilst these stay within a limit because of the good brightness indoors, these are considerable outside. Therefore, at least a shadowy place ought to be found for working with the laptop outdoors. The stable viewing areas turn out to be generous in a horizontal field, but are impaired by increasingly intensifing reflections when the viewing angle is flattened. It comes fairly fast to a noticeable image deviation in the vertical viewing field. In this connection, it should be mentioned that problems with the maximum opening angle of about 130° could turn up just at mobile use on the lap. Every now and then, a few centimeters are missing for an ideal image. 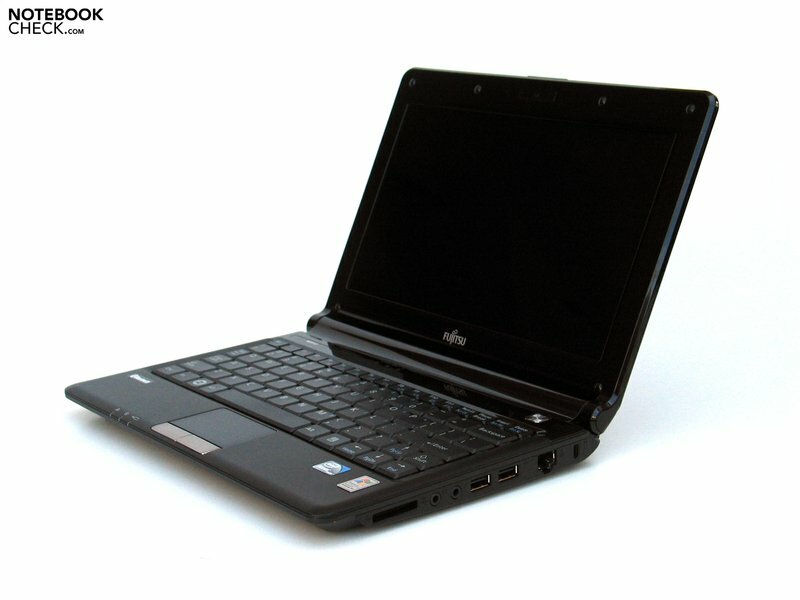 Aside from Intel's Atom N280 CPU, the N270 CPU is also employed in many netbooks. With a slightly lower clock rate of 1.6 GHz (compare: N280 1.66 GHz), there shouldn't be a signifcant performance difference, though. The given performance is sufficient for the intentioned application field of internet and office, in any case. For instance, internet surfing, mail traffic, mobile communication, word processing and undemanding image editing could be listed as possible application fields. The Atom CPU's single-core architecture leads to short waiting times at multitasking use every now and then, but simple tasks are completed quickly. 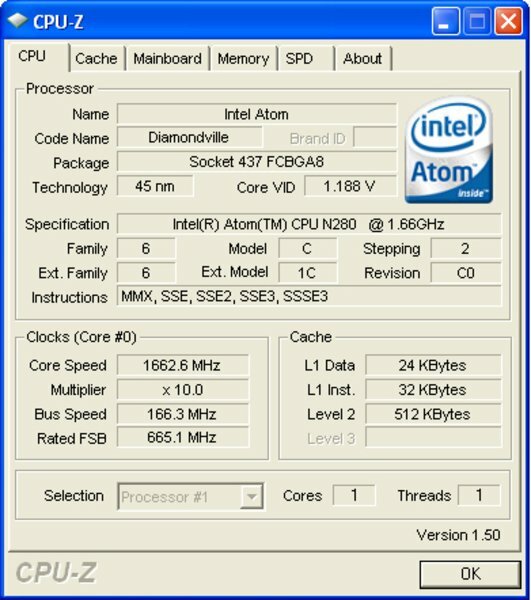 Anyway, Intel can't yet serve with the comforts of current dual-core processors in the Atom chips. 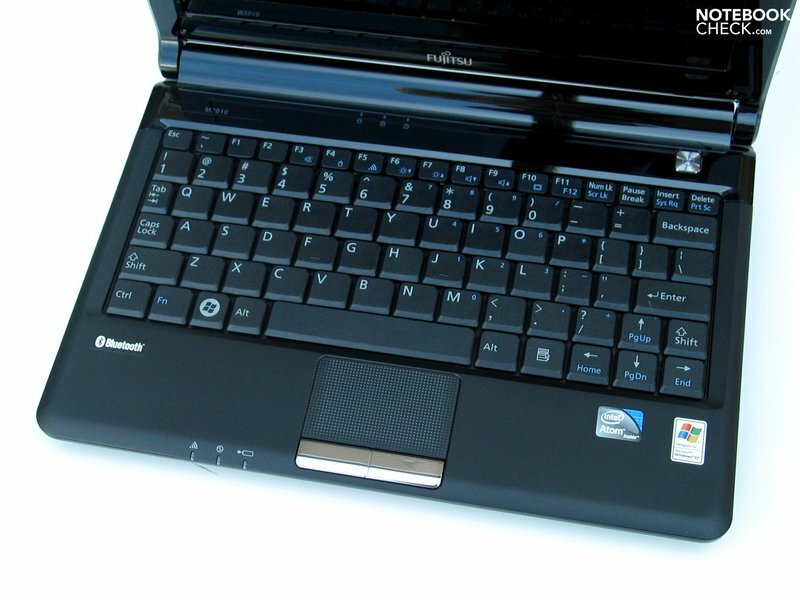 Therefore, the Fujitsu M2010 netbook presumes a certain tolerance of the user. 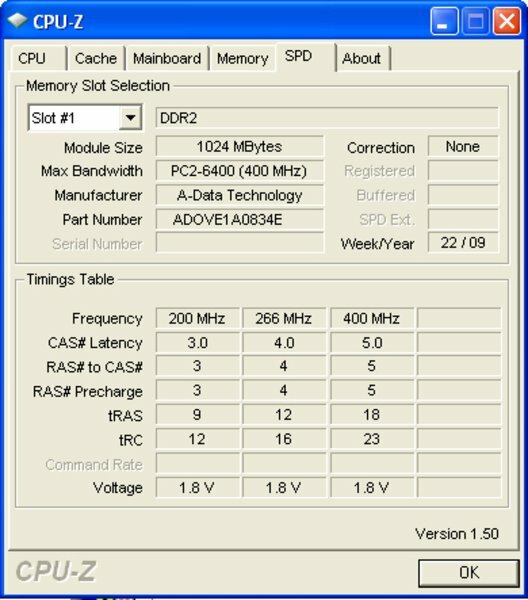 A one gigabyte DDR2 PC2-6400 memory is used aside from the CPU and GPU. Because the mainboard only has one memory slot, this can be exchanged for a 2 GB bar at most. But this isn't substantial for the use with Windows XP. Fujitsu uses a hard disk (MHZ2160BH G2) with a gross capacity of 160 GB as a mass memory. 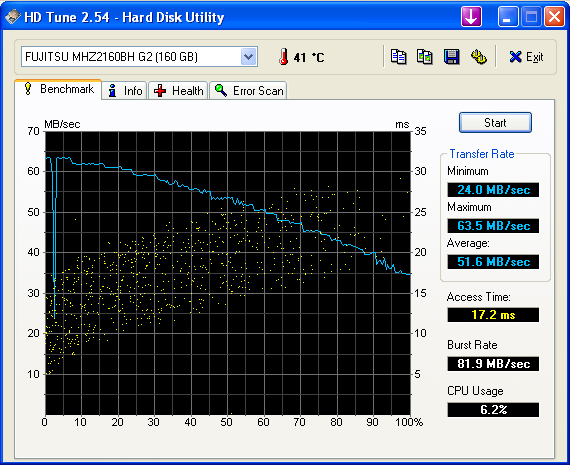 The hard disk works with a velocity of 5400 rpm and presents adequate results in the HDTune benchmark test. 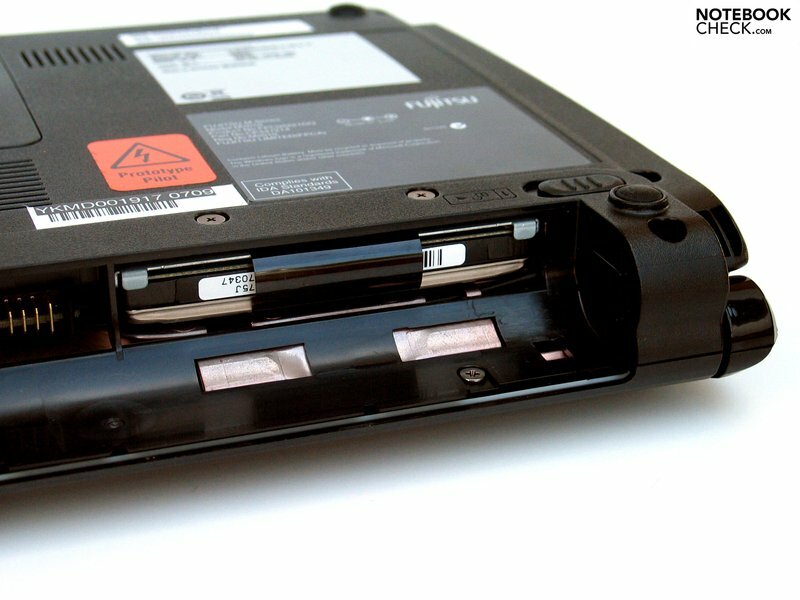 The hard disk can be accessed via the battery slot. The data carrier can easily be removed or replaced by another model, even by a layman if need be. 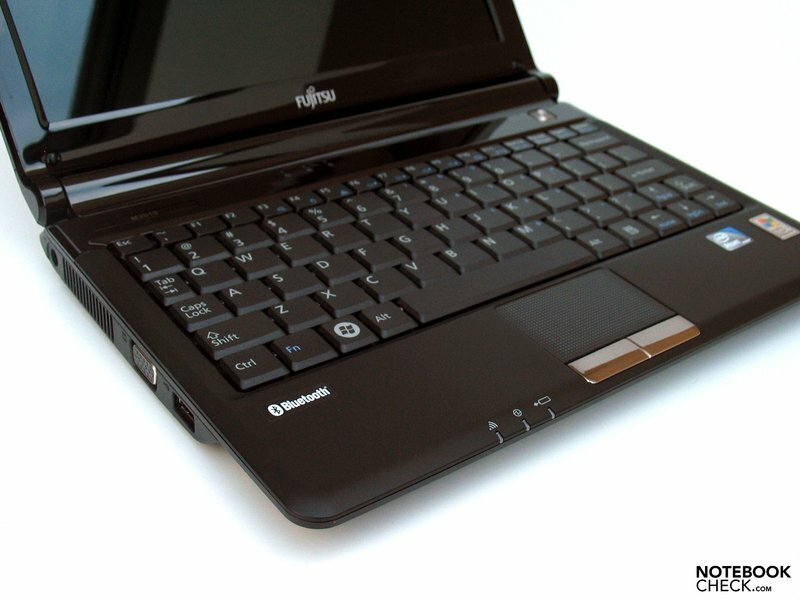 On the whole, the Fujitsu M2010 shows itself to be a very quiet contemporary. The laptop remains discreetly in the background with only 31.4 dB(A) under low office load, i.e. internet surfing - that is, as long as there aren't only flash animations running. Every now and then, we could observe a short intermission, in which the fan turned up and the netbook became distinctly audible for a short time. We managed to tickle a maximum volume of 41.56 dB(A) out of the fan with CPU and GPU load. This condition should barely ever be reached in practical use, though. As usual, we analysed the heating up of the case's surface both under load as well as in idle mode over a period of several hours. We could record a maximum temperature increase of up to 38.3°C on the case's upper side, and up to 36.7°C on the bottom side in the first case. Both results are definitely in an unproblematic field. In idle mode, or rather in office mode with low load, the observed surface temperatures were very similar. The biggest part of the base unit's upper side stayed in a range of a bit over 30°C and at a maximum of 36.6°C. The bottom side continuously heated up slightly more than under load, which results from the lower fan activity. The maximum remained equally under that of load with 35.1°C. 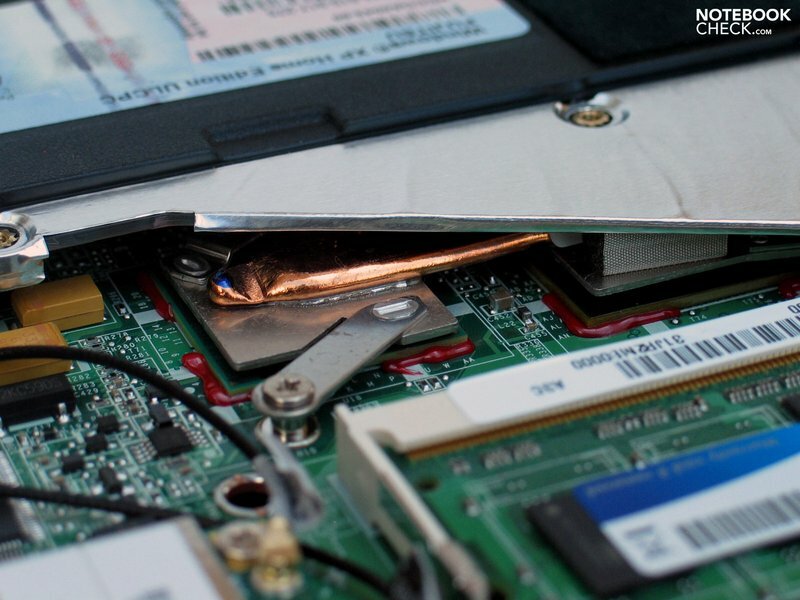 (+) The average temperature for the upper side under maximal load is 31.5 °C / 89 F, compared to the average of 29.8 °C / 86 F for the devices in the class Netbook. (+) The maximum temperature on the upper side is 38.3 °C / 101 F, compared to the average of 33 °C / 91 F, ranging from 21.6 to 53.2 °C for the class Netbook. (±) In idle usage, the average temperature for the upper side is 32.1 °C / 90 F, compared to the device average of 29.8 °C / 86 F.
Fujitsu lists "2x stereo speakers for high sound quality" as a special feature on the homepage. If this is true, then this would be really something special among its netbook colleagues, as mini-notebooks usually don't have much to offer in view of audio rendering. The practical test disillusioned us. Well, both speakers emitted useable sound for undemanding background music, but in our opinion it's quite far from being high quality. The sound quality is subjectively barely any better than in various other netbook colleagues - rich basses and clear midranges/trebles are obviously missing. 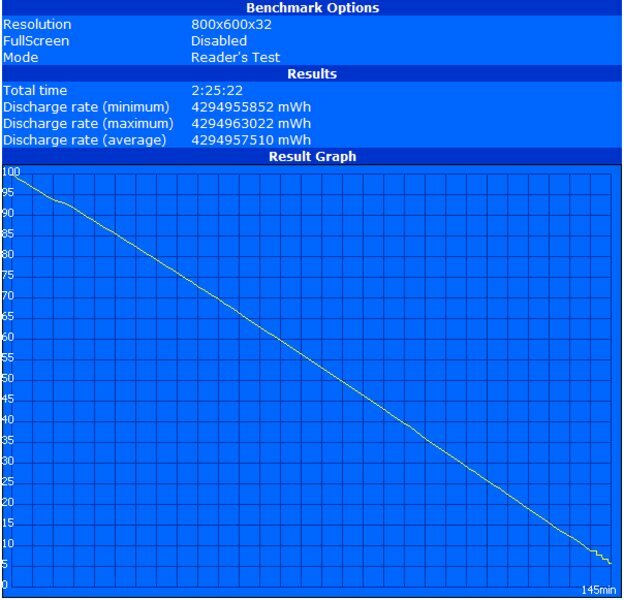 Our prototype, tested with the 3 cell battery, gave us an average result of 145 minutes in the maximum battery runtime test (BatterEater Reader, energy savings profile, min. display brightness, WLAN+BT off). In the "worst case scenario", hence under load (max. display brightness, WLAN+BT on, desktop profile), the notebook just only achieved 94 minutes. The standing power of the practical WLAN surf mode wasn't very impressive, either. We established roughly 110 minutes here - that's not even two hours. In our opinion, this is definitely too little for the intentioned mobile use of a laptop. Users who want to work remote from the mains for a longer period should take the larger battery alternative, in any case. 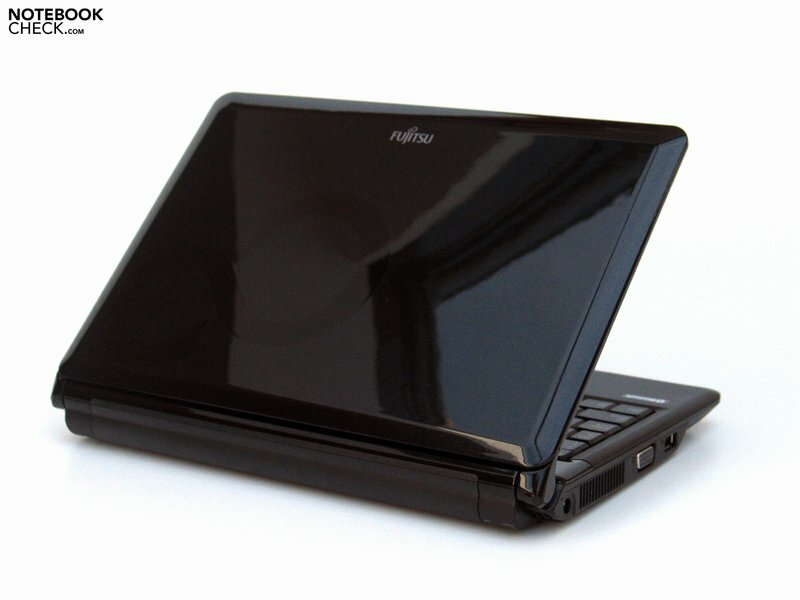 The Japanese manufacturer Fujitsu launches yet another netbook of the 10 inch category onto the market. Even if it's their first, it's the nth model available. 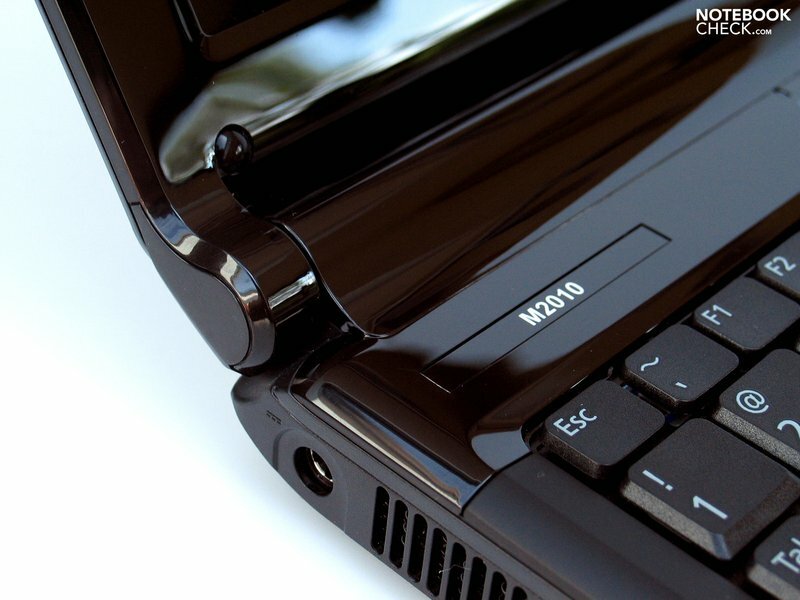 The M2010 can score well with a compact and very stable case. The high-gloss surfaces are attractive to look at but not really practical, as they are soon covered by numerous fingerprints and also very susceptible for traces of use. Fujitsu's M2010 doesn't bid anything new for input devices. The keyboard has a good typing feel at use and the key size turns out to be adequate, too. 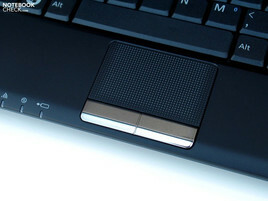 We only had problems with the English layout and with the touchpad keys in the test. The display presented very good elements. 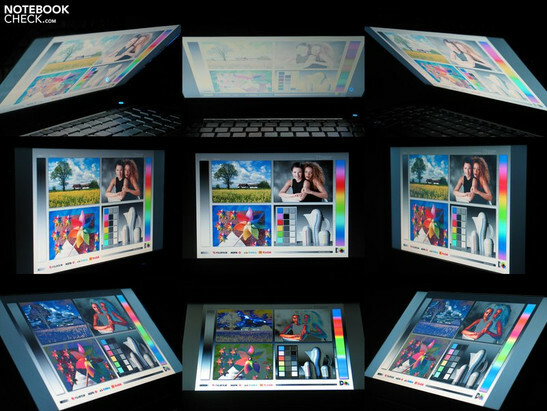 For instance, it can score with a very good maximum brightness as well as with a good illumination. The color representation is alright, but it's necessary to acquire a taste for the reflective surface (especially at outdoor use). There's nothing new to be reported in view of performance, either. 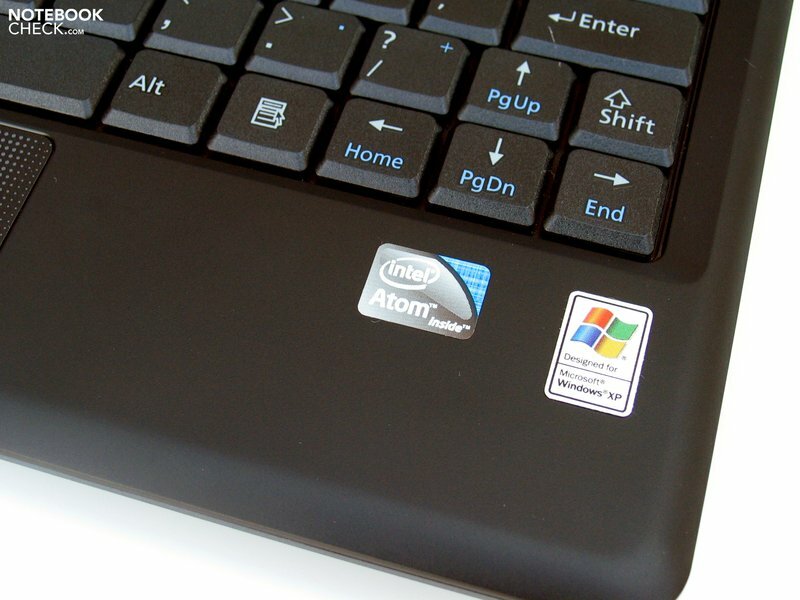 The combination of Intel's Atom N280 CPU and Intel's GMA 950 graphic chip has, as before, enough power reserves for accomplishing simple office tasks sufficiently fast. 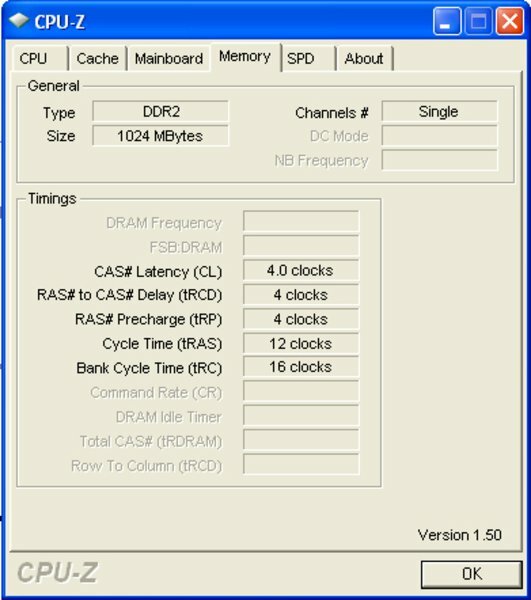 The performance of a dual-core computer shouldn't be expected. 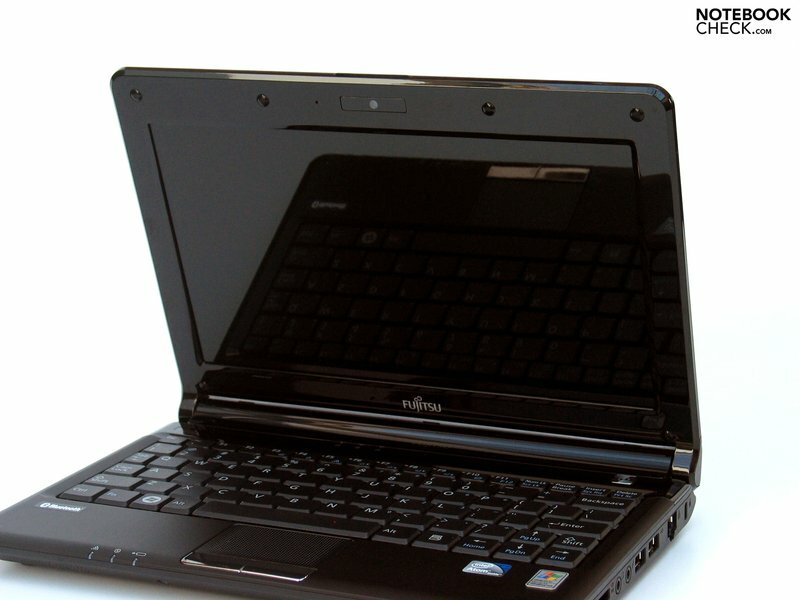 The Fujitsu M2010 rewards the user with a very low-emission operation - in both system noise and case temperatures. The built-in speaker couldn't fulfill our expectations. The same applies to the given battery life, at least with the 3 cell battery included standardly. Short of 2 hours in WLAN mode isn't very much for a netbook. The up to 2.5 h in more favorable conditions couldn't change anything about this, either. 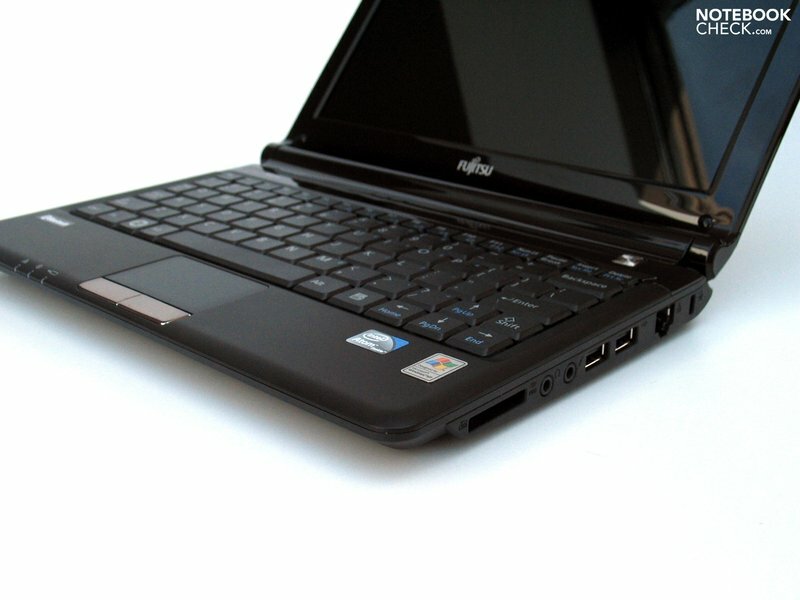 The Fujitsu M2010 is a compact netbook in a 10 inch format. 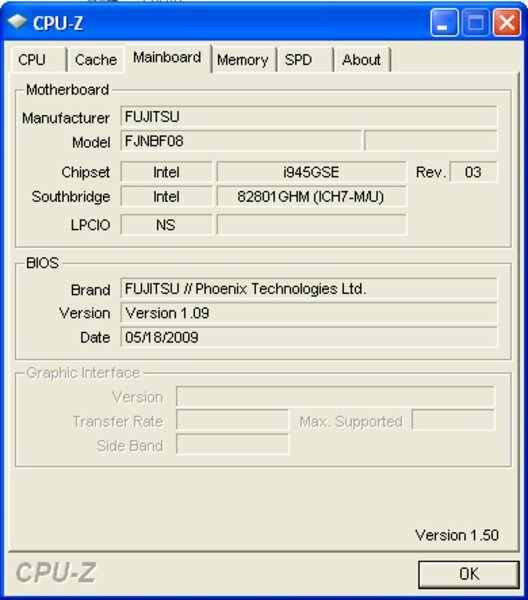 Fujitsu uses a netbook-typical WSVGA screen with a resolution of 1024x600 pixels for a display. The display has a good brightness but the reflective surface makes an outdoor use difficult. 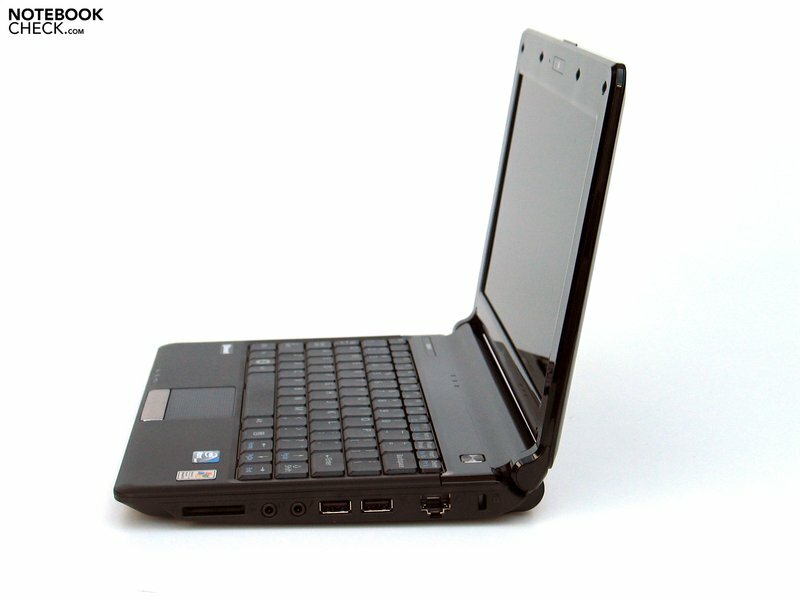 Classic netbook fare also comes to use in view of performance. 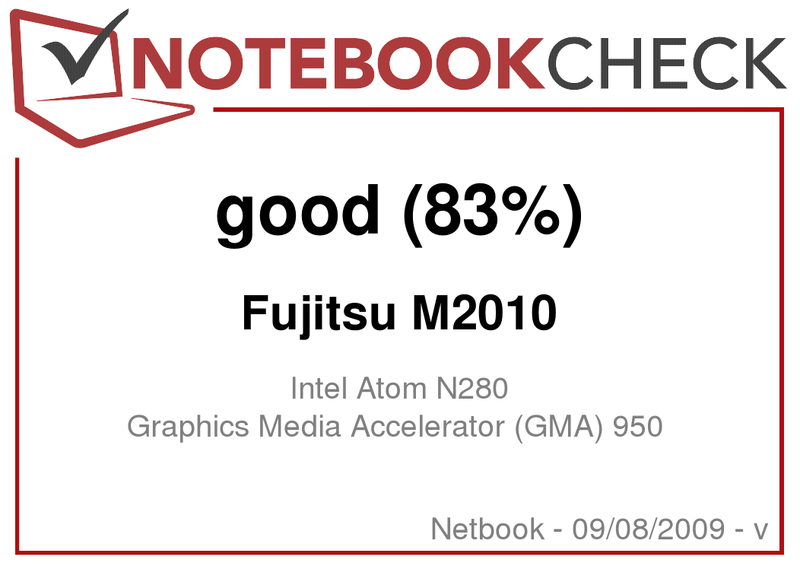 An Intel Atom N280 CPU paired with the Intel GMA 950 graphic is employed in the Fujitsu M2010. The mini-notebook makes office applications possible with this. Fortunately, the system noise usually stay discreetly in the background. The temperatures of the case surface are kept in an uncritical field, too. The sound quality of the used speakers turned out averagely at most. Basically, the touchpad can be well used, but both keys are highly in need of accustomization. Only the English layout was a bit irritating in the test. 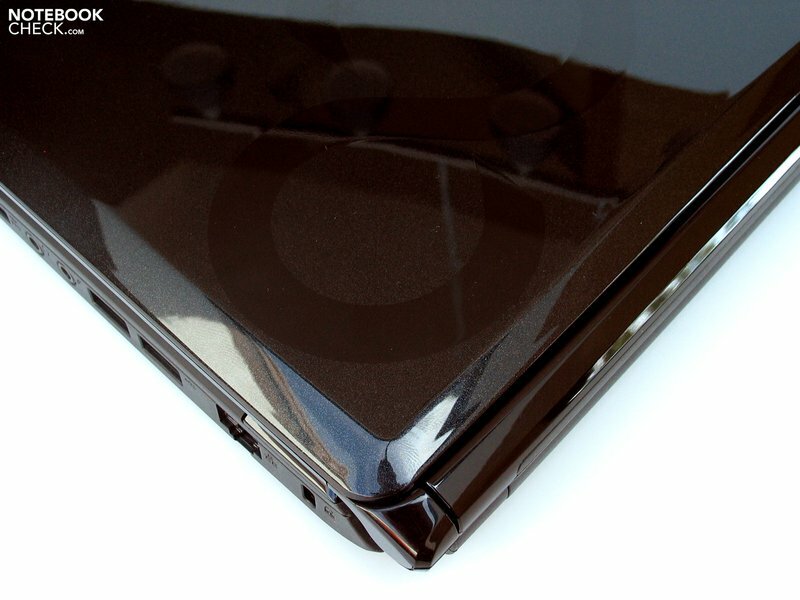 Aside from the completely black alternative in our test, Fujitsu also has two further color options. Especially, the high-gloss finish of the display and parts of the base unit is substantial for the handling and the look. 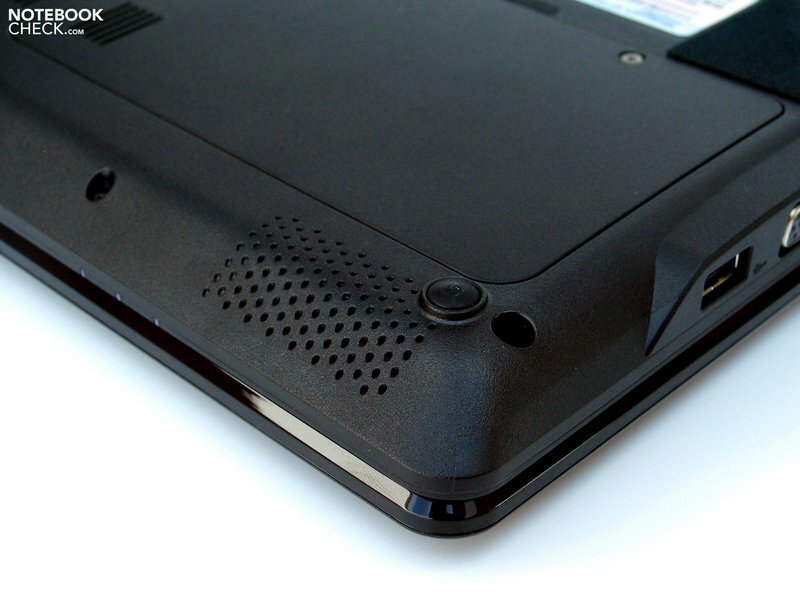 The case's good stability is dampend by the smudge susceptible surface. 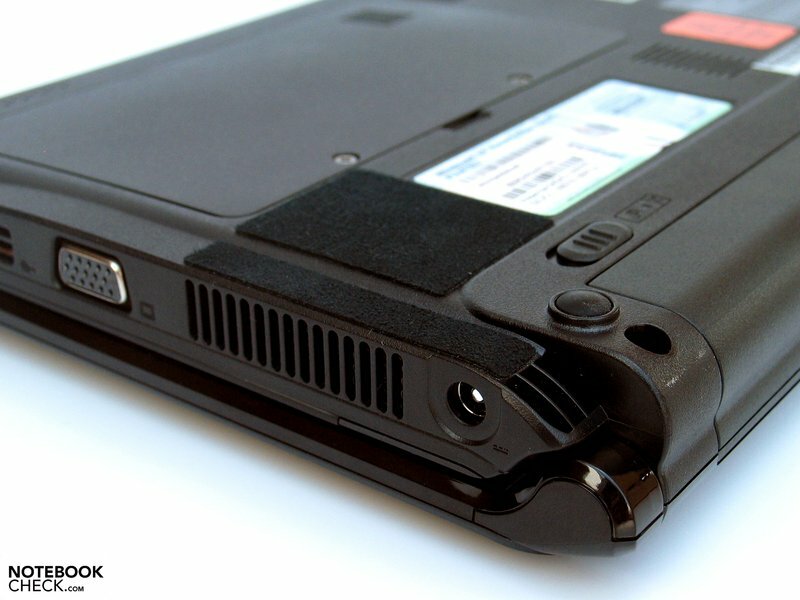 Also important for the netbook's appearance is the hinge, which accommodates the battery. 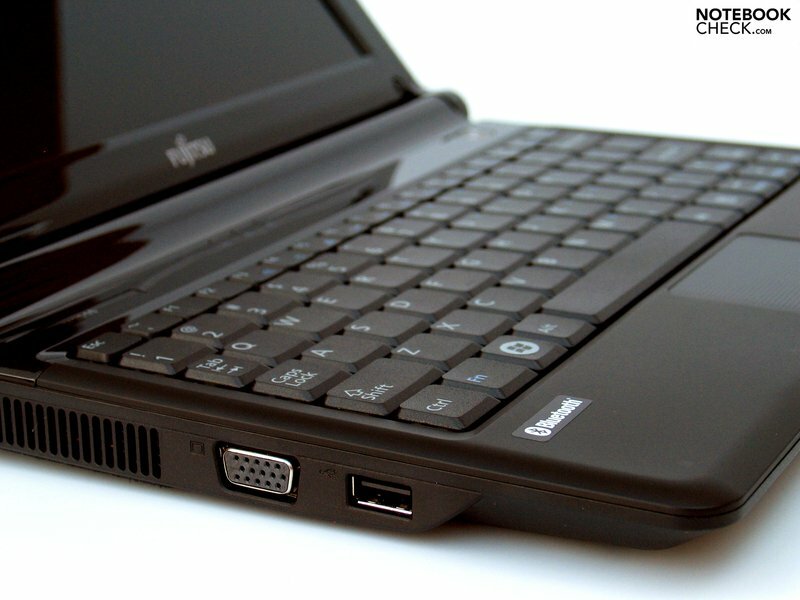 ...merely the basic netbook ports, such as USB and a VGA-out, are given. 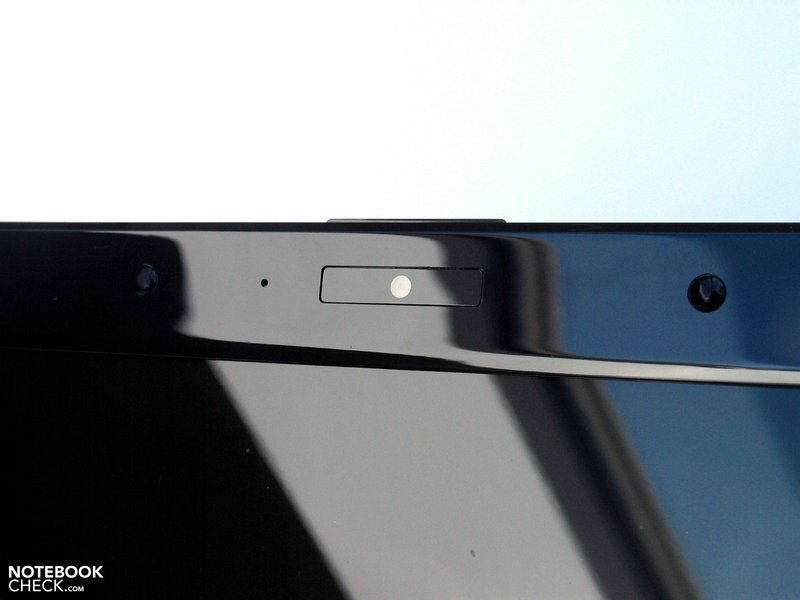 There is, however, a 1.3 megapixel webcam integrated into the display bezel. 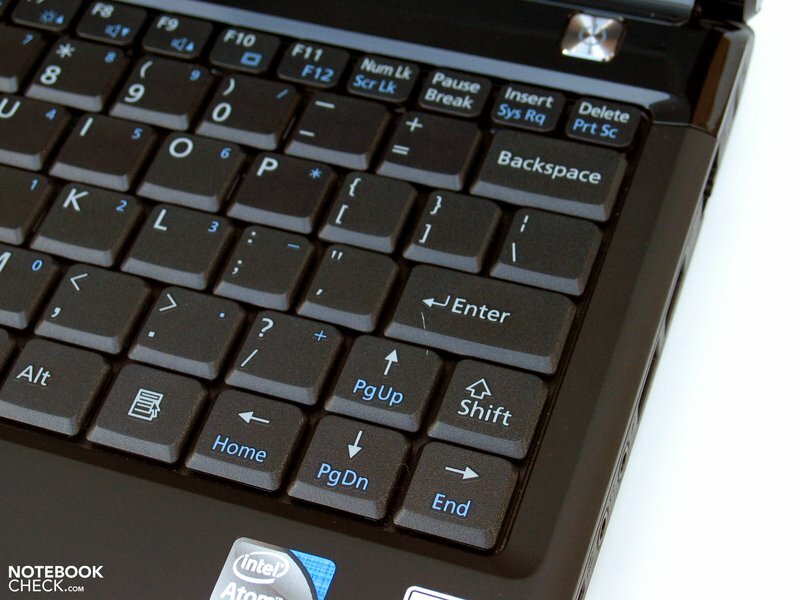 The keyboard has a sufficient size, which allows the input of even more extensive texts. The battery life was rather disapointing, especially with the 3 cell battery built-in ex-factory. As (almost) always: a matt, completely outdoor suitable display, a more unsusceptible chassis, and in this case the larger battery for practical mobility, too.